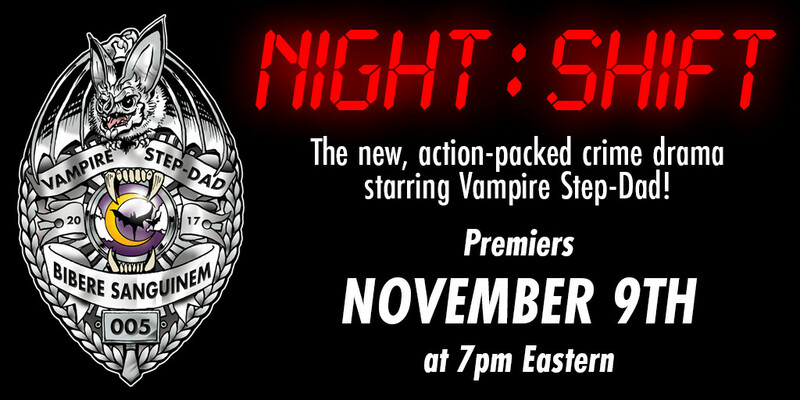 November 9th – New EP from Vampire Step-Dad! This EP will have ELEVEN tracks! What’s that you say? Eleven tracks isn’t an EP? That’s an album? Well, perhaps, but not all eleven tracks are full songs. No, this EP is more more along the lines of a film or TV score, where some cues are just 30 seconds or so. But, despite this, this is my longest release yet. So that’s cool, huh? I spoke in the past about being kind of unsure about this one, but I can tell you confidently that this is gonna be a good one. I’m really excited about it. I’ve got much to tell you in the meantime, but I’ll save that for later. Why? Well, it’s a good way to make sure you don’t miss any of the info I put out before the release. You say you’re “Going” and you’ll get a notification each time I post something new. And trust me, I have a lot of fun things to share leading up to the release. If you know of someone you think might like my stuff, send ’em an invite! OK, that’s all for now, but there’s much fun to be had in the coming weeks! I can’t wait to share it all with you!